Whoa, guys. A couple weeks ago I did a major closet clean out and removed over 100 items! I’m still baffled as to how that was all squished into my closet, but getting rid of clutter feels good! As a style blogger, you’d think I’d love having tons of clothes, but that’s not really the case. I’m not a minimalist by any means (though my husband basically is when it comes to clothes), but I still don’t like having more clothes than I can keep track of. 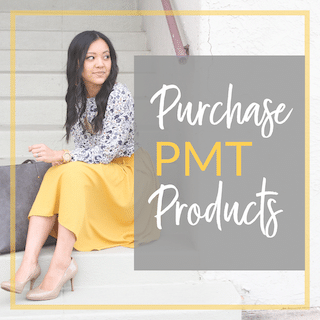 If you’ve been around PMT for a while you know I seek to build a closet full of versatile pieces that I can wear different ways which keeps my wardrobe a lot more manageable. And that’s how I’d like to keep it–style blogger or not! However, my closet was getting way overgrown for my liking. I had a baby in April, so there were lots of clothing transitions last year between maternity wear, clothes for early postpartum, allowing myself to update some breastfeeding-friendly options, getting stronger and losing weight, and the usual seasonal changes. Plus there were the “normal” pieces to discard like the ones I liked for a season but was ready to move on from. 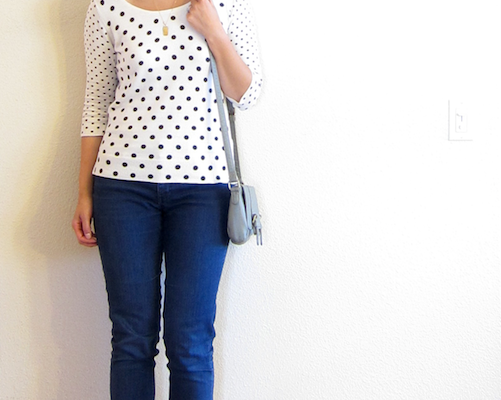 And then there were tons of pieces hanging around simply from being a style blogger. While I share lots of old items (to the point where you might be sick of seeing them, haha!) I still have a good amount of new stuff that rotates in, especially when I do sponsored posts and use pieces from a brand’s current collection. Sometimes I’ll keep those items, which means I need to get rid of more of my older stuff. 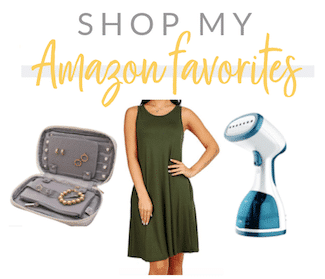 Sometimes the items I choose are great for some of YOUR needs but I may not need them personally, like super warm sweaters or a business casual skirt. (I have a few of those in my closet, but I don’t need a TON of them and it doesn’t make sense to keep 10 of them when I only need 2 or 3, for example.) Sometimes when I’m less sensible, I’ll keep items that I don’t need at all but just am not ready to part with, haha! Anyway, I had quite a few sponsored posts towards the end of last year which resulted in an overflowing closet (plus all my maternity, postpartum, etc. clothes), and my closet was ready for a major clean out! 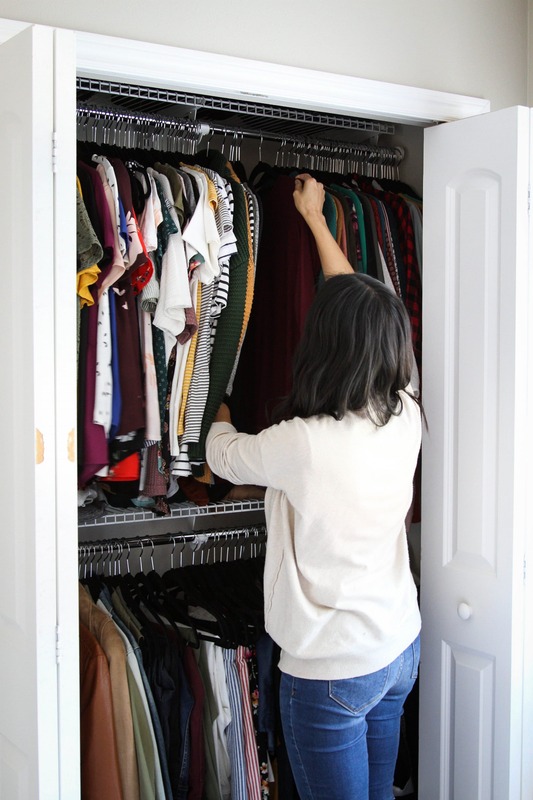 If you haven’t done a closet clean out recently, I highly suggest doing one this month! It feels sooooo good! 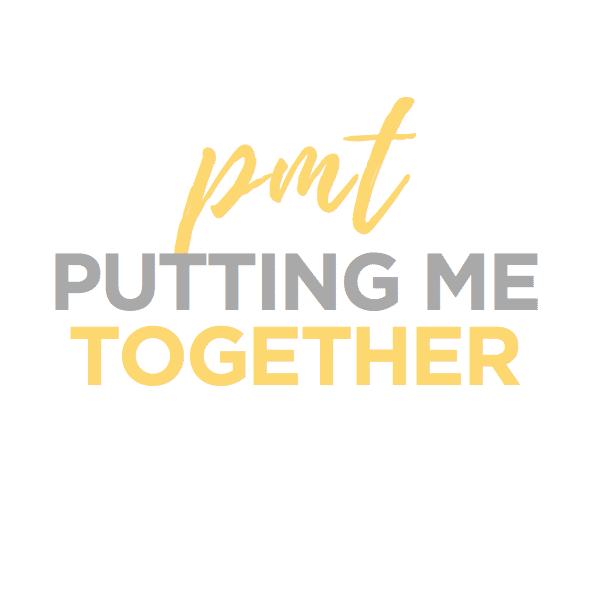 Today I’ll share why you should do one, how I decided what to get rid of and what to keep, what I gained, and what I might do with the pieces I got rid of. If you don’t want to do one, at the very least I always find a peek into people’s closets fun, so I hope you enjoy hearing about mine! My process was very, VERY simple. In the past I’ve thought long and hard about whether to get rid of something, and this time I just made quick decisions with a very simple process. Took everything out of my closet (and drawers) and only put back what I loved or what sparked joy. I regularly do mini clean outs where I leave everything in my closet and only remove what sticks out to me as pieces I don’t love. But, I remembered how powerful it was to take everything out of my closet when I KonMari’d my closet a few years ago. Taking everything out of my closet and only putting back what I loved is SUCH a different experience. It makes it feel like every piece needs to earn its place. Put discarded items in either pile: Donate (or sell or just generally get rid of) or Tailor. In the past I’ve also had a “purgatory” pile where I put stuff I knew I should get rid of but still couldn’t part with. I put them into a closet that I never used. I’d revisit those items several months later and see how I hadn’t thought about them at all since, and that helped me finally let them go. 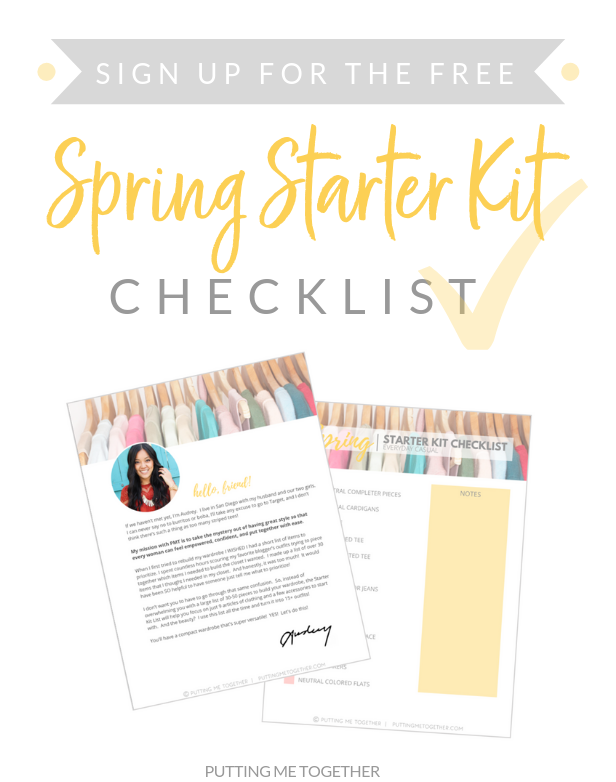 I still do that with mini clean outs, but this time I didn’t need to do that since I just let myself keep whatever I loved or sparked joy–I didn’t have to part with anything I wasn’t ready to. Boxed up specialty items like maternity clothes, swimwear, or sweaters. (Okay actually, I ran out of boxes for swimwear and need to get more, so those are in a pile at the bottom right corner of my closet, haha!) For the most part I don’t remove seasonal items since I live in a climate with fairly steady temps through out the year. Mostly I put shorts away during winter and thicker sweaters away during summer. But, I keep my sleeveless shirts in my closet year round, etc. I did this with my regular clothes, workout gear, socks and undergarments, and scarves. That all took me like 2.5 hours (I think?? Can’t remember.) But I still have to go through my shoes and jewelry as I ran out of time! Over 100 articles of clothing in addition to tons of belts that I haven’t worn in years, lots and lots of scarves that were several years old, and socks and undergarments. I’m actually kind of shocked at that number because who the heck needs that many clothes? 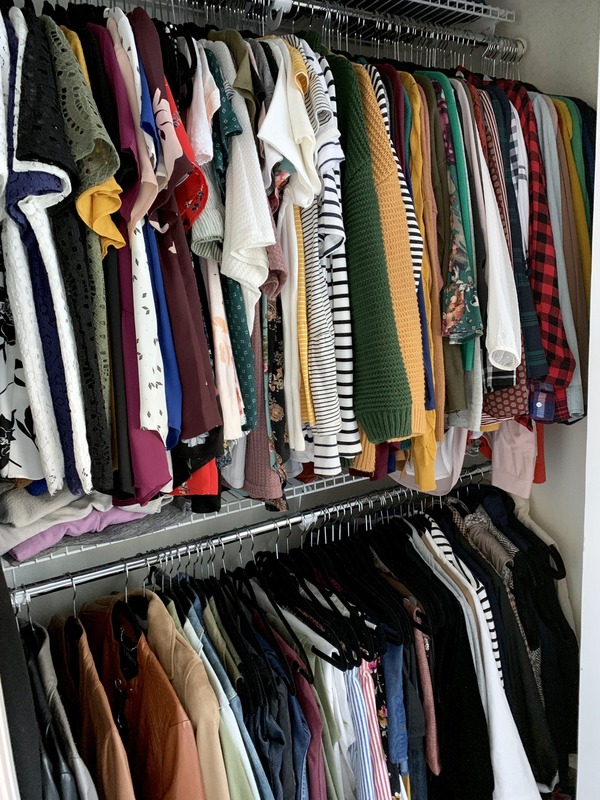 But I also have to remind myself that as a style blogger I deal with more clothes than the average person, and that number is a result of a blend of my own personal shopping and “work” (all the things I said in the intro above about how blogging affects my closet). The real thing that puzzles me is how they all fit in that tiny closet! They were mostly in the main closet you see here, two drawers in the dresser I share with my husband, and a small portion of the closet in my office. Still, I have no idea how all those items fit in my closet because as you can see in the pics, my closet is still full even after 100+ items were removed. 😳 Like I said, it was quite overgrown! Among those articles of clothes were: old items I purchased when I first had Addie, breastfeeding-friendly items I’d saved from 4 years ago when I first had Addie and nevfwer used with Ella, items I loved that no longer fit because of trimming down from FASTer Way to Fat Loss, new items from sponsored posts that I didn’t need or have room for, older items that got replaced by other new items from blogging, and the general “I just don’t love that anymore” pieces. Why Do a Closet Clean Out? 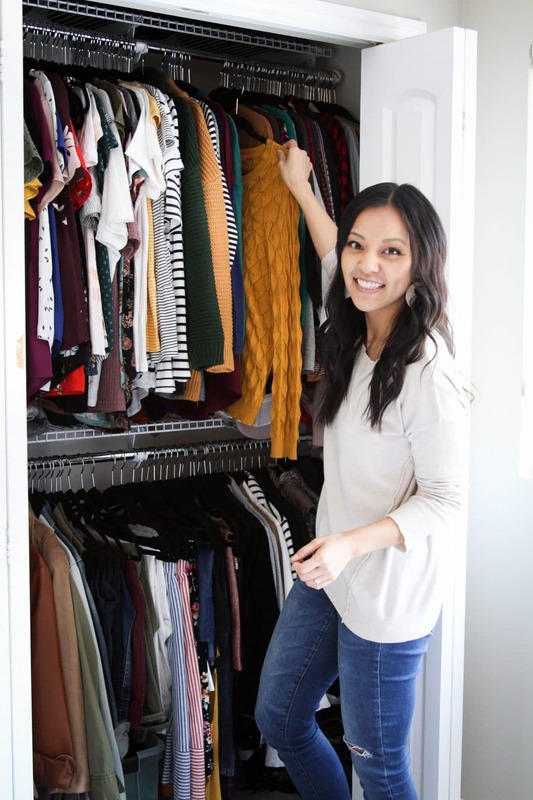 Here’s why I loved cleaning out my closet! – Clears mental and emotional baggage. Sifting through items that you don’t love clutters mental and emotional space and weighs you down. It’s safe to say that most of us have items hanging in our closets that we don’t wear. And why? Usually we don’t love them, they don’t fit well, they don’t make us feel great, we bought them against our better judgment, or we just don’t like them anymore. Every item I sift through my closet and pass by one of those items, all of those thoughts and the corresponding feelings flutter through my mental and emotional spaces. Either I sigh about how that piece doesn’t make me feel great, I feel regret for buying it, I feel guilt for not wearing that perfectly good piece, or all of the above. It’s brief, and almost unconscious, but it happens. And it happens with every piece in my closet that I don’t like. That’s a lot of baggage to feel every time I open my closet! 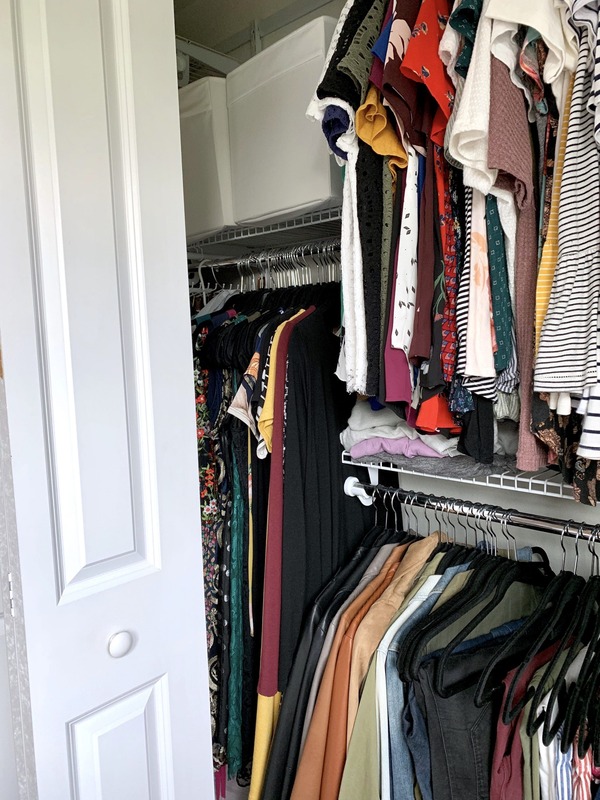 Weeding out those pieces and not having to feel those things whenever I open my closet makes opening my closet a much more pleasant experience. – Allows you to focus on what IS good. Bad items are distracting, plain and simple. If our closets were gardens, the pieces we love would be the pretty flowers, and the things we don’t love would be the weeds. It doesn’t matter how many pretty flowers you’ve got in there. If you have a ton of weeds, it’s hard to enjoy those flowers! When we have a bunch of stuff in our closets that we don’t love–when we have a lot of weeds–it distracts us from focusing on what we have that is good. With the weeds gone, I was reminded of pieces that I love and can now better enjoy them. – Helps you move on. There are many, many not great reasons I keep clothes that I don’t need. One of them is that I haven’t accepted that my lifestyle or body is now different and that I don’t need certain clothes anymore. Another is that I regret having purchased something and hang onto it trying to convince myself that someday I’ll wear it. Another is that maybe I didn’t regret buying something at the time, like some of my breastfeeding-friendly clothes I bought with Addie 4+ years ago, but didn’t want to wear with Ella because my style had changed, and I felt guilty for not wanting to wear perfectly good pieces just because I have a different style preference now. Cleaning those items out of my closet can be a way of moving forward and fully embracing that my lifestyle or body is different, or it can be a way of accepting that I made a shopping mistake and moving on with my life instead of continuing to try to make up for it. Or it can be a way of accepting that my style preference has changed and allowing myself to say that’s okay instead of feeling bad for wasting pieces. Whatever the case, it’s very freeing to move on! Rediscovered items I love. Already mentioned this with the flowers and weeds, but taking things out and having to put each of them back helped me see each piece instead of gloss over them like I usually do. I was reminded of how much I love a few pieces! I can get by with just a few scarves. Years ago I wore scarves all the time, and during this round I finally got rid of almost 20 of them and kept: a leopard print scarf, black plaid blanket scarf, white plaid blanket scarf, orangey tan plaid blanket scarf, red plaid blanket scarf, mustard yellow scarf (linked similar one), grey infinity scarf, taupe infinity scarf, and one or two lightweight floral scarves if I remember correctly. It’s okay to let your tastes change. I mentioned that I was reluctant to let go of pieces that were perfectly good but that I didn’t love anymore simply because my style had changed. Once I kinda did the KonMari thing of thanking that piece for how it served me, letting it go was an act of giving myself the freedom to have changed. Our tastes are not static, nor are our lifestyle needs. Changes are perfectly natural part of life, so it is perfectly okay to no longer need certain pieces. I’ll need to buy replacement items for things I got rid of due to weight loss (mostly jeans). I have to decide if a few pieces are worth tailoring or if I’ll end up just getting rid of those too. And then I’ll give away and/or sell my clothes. Many pieces are brand new and were hardly worn! Years ago I used to sell my old clothes, but it got to be quite a lot of work. 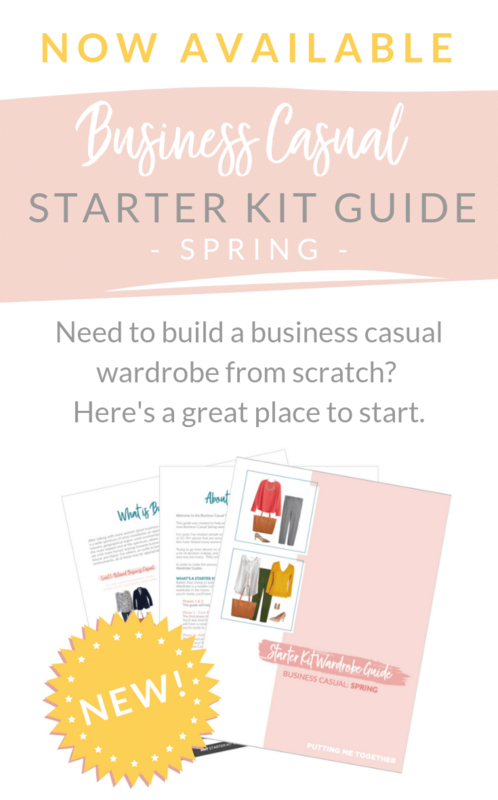 I’ve sold to thredUP a couple of times, but while I like purchasing from there, you don’t recoup many costs selling to there. However, sometimes something feels better than nothing. Lately I’ve just been letting my friends go through bags of my clothes and take whatever they want. I’ve really loved that because a lot of my friends are in ministry and work for non-profit organizations, so new clothes are a luxury, and they get so happy about brand new quality stuff for free! We also donate regularly to a local organization, and I love knowing that people who could really benefit from quality items are receiving items for free. Have a clothing swap with friends – Google it if you’ve never done one! Fun way to trade clothes with friends and great excuse to hang out! In case you’re interested, our closet system is Rubbermaid from Amazon (HERE) and it’s customizable to build any shape or configuration you need. We’ve had ours for 4+ years and love it! Some piles still at the bottom, like swim wear, since I need to buy more boxes. There are a ton of cardigans on the right side that you can’t see because they’re blocked by the door. Small section inside for dresses. Scarves are stored in those bins. This is the section between my portion of the closet and my husband’s. His half is on the other side of these dresses! The portion of my closet that was hidden by the doors. My oversized cardigans are folded on the shelf in the middle, currently hidden by clothing. I usually want to know more info about people’s wardrobes, so in case you’re like me, you can shop through the widgets below to see some of the items I hung onto! 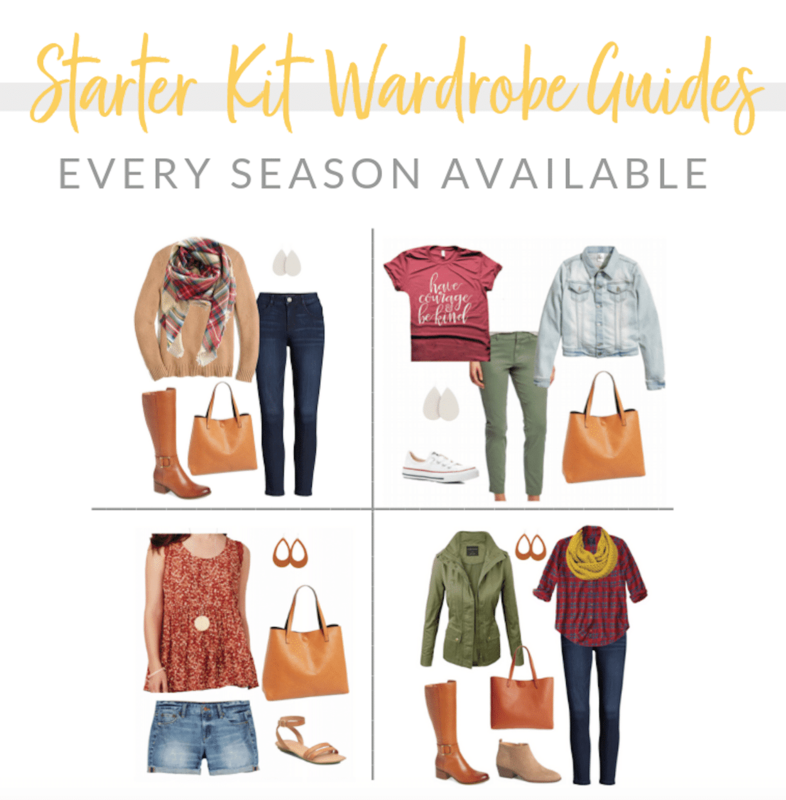 And–shameless plug–if you are rebuilding your wardrobe from scratch and want a curated list for items to prioritize, check out one of my Starter Kit Wardrobe Guides! If you haven’t done a closet clean out for a while, I HIGHLY recommend it! Getting rid of clutter feels amazing! My friends and I started doing Clothing Swaps about 5 years ago – we do them every 4-5 months and they are SO FUN! Everyone brings whatever they don’t fit, don’t wear, don’t love – we pile it all over my house (pants go on my bed, tops go kitchen table, coats, dresses go on different tables, shoes along the hallway, etc). We have about 90 minutes to just go through everything and try stuff on. Anything you are interested in taking home goes in one big communal pile in the living room. After the time is up, we each get $1000 fake money and we auction off each item in the pile. It’s such a great system because even though you may have seen something first, someone might be willing to pay more for it. Once your money is gone, you’re done! Everything left in the house get donated to a charity. That sounds fun and sounds like a great idea! Thank you for sharing! I just read Marie Kondo’s book and have the tidying itch. I love that you took her method and made it your own (I plan to do the same). Do you have any hanger recommendations? I have been wanting to move my clothing to all matching hangers, but haven’t taken the leap – not sure where to commit! Costco or the joy mango (or whatever they’re called haha) from the container store or real simple from Ed bath and beyond. They’re all the slim line hangers. Thank you! I almost bought Costco, but just found a similar hanger from Amazon Basics at a lower price. We’ll see how they do when they arrive! Thanks again for the inspiration. Ohmigosh, for as much as I shop at Amazon I have no idea why I never thought to buy them there! Awesome! I finally watched a couple episodes of Marie Kondo’s show this weekend! Now I wanna go back and fold the clothes in my drawers. Luckily there’s not much in there after having done this closet clean out, hehe! I think one of the biggest realizations in this closet clean out was that it’s okay to let my style change. I mean, I know I wrote it in this post, but the more I sit on it, the more significant it’s becoming. I always thought of style as static since people talk so much about investing in pieces that you’ll have for your life. But realistically, I don’t even know what will be a lifer until…well, until after it’s been in my closet for years. Haha! As my lifestyle changes, my style changes. And as I get older my style changes. I’m LOVING accepting that, and I think it’ll continue to give me mini lightbulb moments through out this next year! Also thank you so much for following for as long as you have! I recently started using Poshmark. It’s not difficult to use but you have to be dedicated to logging in every day to re-share all your listings so they don’t get buried in everything else. It’s very time consuming, so if you’re like me and want something simple and low-maintenance, Poshmark probably isn’t for you. You also don’t get a lot of time to ship items you’ve sold, just two days before a buyer can cancel their purchase, which doesn’t always fit my lifestyle. I’m actually thinking about deleting my entire closet on there and just donating all the items. SO helpful to know about the maintenance required. Definitely not where I want to spend my time! In three months, I’ve sold two items. And nothing I’ve put up has been old at all! I’m definitely emptying my online closet. Gonna let some old coworkers come ‘shop’ what I don’t want/need anymore. With Poshmark, I think it just depends. I started using it 3-ish years ago and have sold 250 items in that time! 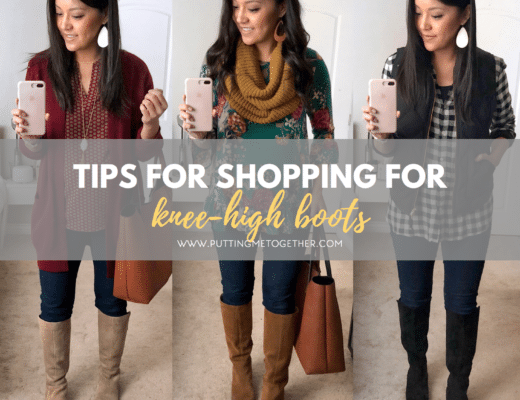 And they’re usually nothing special – Gap, LOFT, Athleta, J. Crew. You definitely have to share your listings, but I’d say I spend less than 30 minutes per day on the app. They encourage you to ship within 2 days, but you do have a full 7 days to ship before the buyer can cancel. Of course, everyone’s experience is different – just wanted to add another perspective 🙂 I’m getting more $$ for my clothes than I would through something like ThredUp, Plato’s Closet, or a yard sale, so I think it’s worth the small time investment. I also just did a massive closet purge and it’s amazing how great it feels! 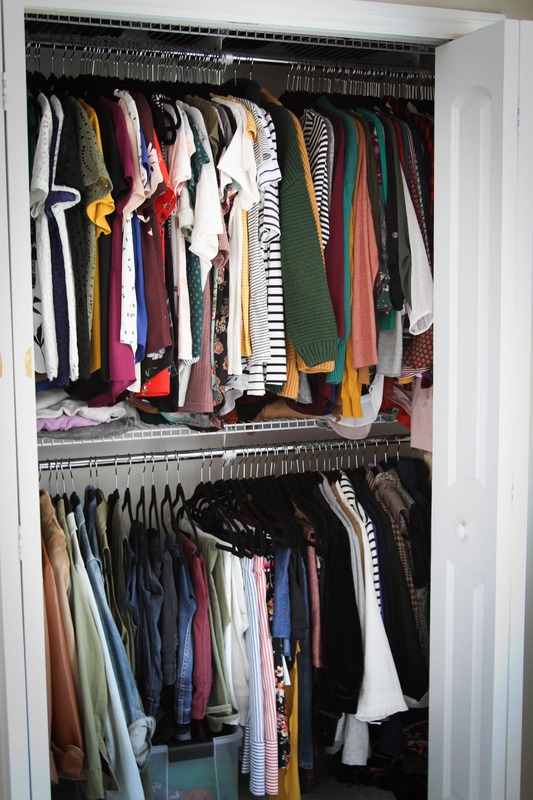 I’d love to know how you organize your closet within each category. I see that the tops seem to be by sleeve length but do your further organize them in some way? 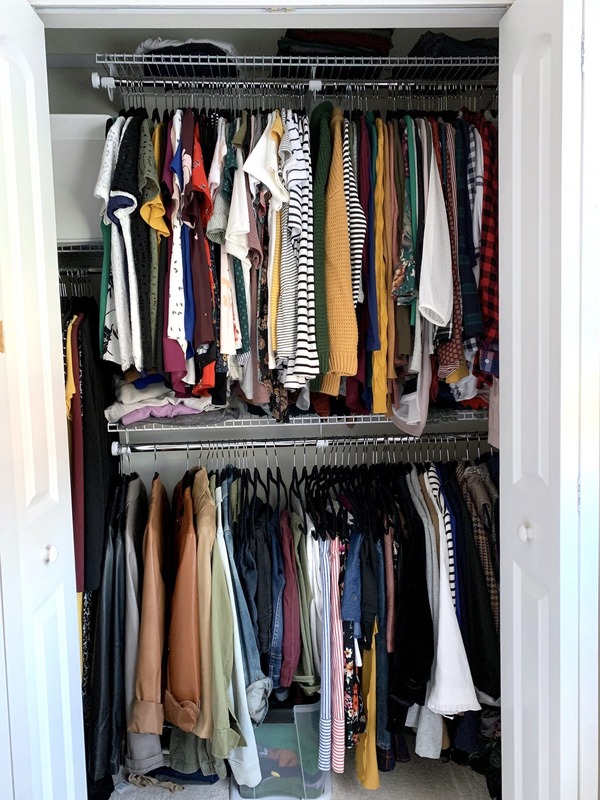 So interesting reading how you did your closet clean out! 🙂 I find I struggle if I try to do it all at once, doing it now and then is easier for me. I picked out 6 pieces last week I felt weren’t working any more to add to the donate pile, but that was only a few minutes, I never seem to have the stamina to go through everything at once, haha! I try to, slowly, do a whole house purge over the winter but I haven’t gotten to my clothes yet. Definitely inspiring to get rid of things I don’t like anymore, even if it’s just to free up the mental clutter! I definitely need to have a closet clean-out. This post just reminded me so thank you!